Born in Malaysia she currently lives and works in London. SooMin received her Bachelor of Arts in Fine Arts in Singapore, 2007. Later, she completed her MA in Multi-disciplinary Printmaking at University of West of England in 2011. She works as a printmaker, works with other artists, as well as being an artist herself. ​ Her practice is inspired by traveling, and ideas based around the environment around her. The transition from a place to another in a journey always amaze her. The anticipation of surprise, revealing the unknown is expressed in her work. Every boundary, every door, wall, window and path leads to reveal the unknown, a destination perhaps. As a printmaker working with artist, she experiences the printing process. The moment when the print is lifted up from the block is the moment of revealing the destination, so as exploring the unknown. She photographs places that she traveled to as well as her surroundings. 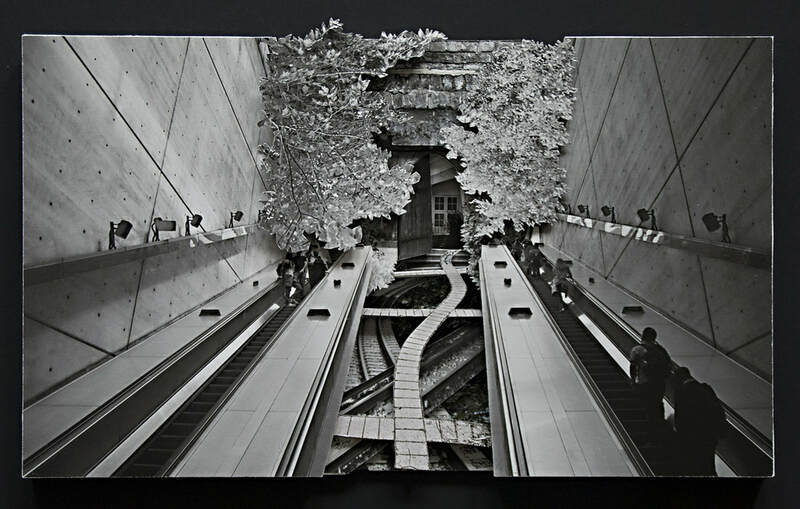 Each piece of work is constructed by photographs taken from various places. The 'gateway' such as the path or the door is cut out by using scalpel and then layer them, which signifies traveling from one space to another, revealing the peculiar, unknown space.